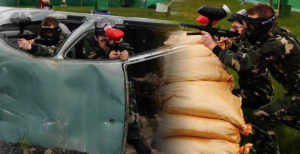 Pallas Karting & Paintball is based in Galway, Ireland, with Go-Karting & Paintball events and packages for corporate, stag, hen & family parties. Pallas Karting is Europe’s Largest Karting Centre, with a 500m Beginners Track and a 1500m Advanced Track. Now with the Additional Attraction of Pallas Paintball, Galways ONLY Paintball Field. With Pallas Paintball, Galways only Paintball facility, you get an action packed day, to find out who is the top soldier in the group. Game scenarios set up to test the best of soldiers, defending or attacking, the cause will be for the team, will you sarcifice yourself in the best interests of the team. The ideal event for Stag, Hen, Corporate or Family parties at Europe’s Largest Karting Centre and Galway’s Premier and the newest Paintball Centre in Ireland.